Holy Crackpots! Presbyterians Publish Wacky 9-11 Conspiracy Book! The 2.3 million-member Presbyterian Church USA, plans to print 7,000 copies of a book that claims that the Bush Administration blew up the World Trade Center and Pentagon! The World Trade Center and Pentagon were actually blown up on 9/11 by the Bush Administration, according to a new book released by the official Presbyterian Church (U.S.A.) publisher and written by a professor at a United Methodist seminary. “That senior mainline church officials would publish this kind of absurd revisionist history is a scandal,” said Mark Tooley, who directs the United Methodist committee at the Institute on Religion and Democracy. 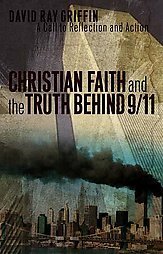 Christian Faith and the Truth Behind 9/11, published by Westminster John Knox Press and written by David Ray Griffin, identifies the 9/11 terrorist attacks as a ‘false flag’ operation organized by the U.S. Government to justify aggression against its opponents. Historic examples of ‘false flag’ operations include the 1933 Reichstag Fire that the Nazis ignited and blamed on communists to justify their dictatorship. Westminster John Knox Press, which is funded by the 2.3 million-member Presbyterian Church USA, plans to print 7,000 copies of the book and has defended what it calls Griffin’s “intellectually rigorous” arguments. It’s not clear how the latest video of Osama bin Laden with two of the 9-11 terrorists will affect sales of the book. Glenn and Helen were just talking about this. HotAir also has a complete 9-11 loon report today. Someone ought to by this group a subscription to Popular Mechanics.